The IRT Powerhouse is Designated! (revised) It is with great excitement that LANDMARK WEST! can report that the Landmarks Preservation Commission voted unanimously to designate the IRT Powerhouse, McKim Mead and White’s 1904 city-beautiful Beaux-Arts style edifice on Eleventh Avenue between West 58th and 59th Streets during a public meeting this morning! Not only does this finally legitimately complete the Backlog 95, it protects one of LANDMARK WEST!’s original WISH LIST sites for generations to come. 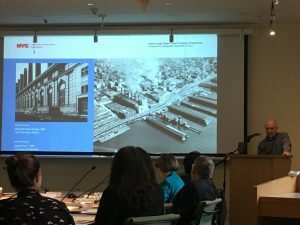 First heard in 1979, then 1990, 2009, and again in 2015/2016 with the Backlog efforts, the Landmarks Preservation Commission made good on the former IRT Powerhouse, and can now check off a 38-year old item from its “to do” list. As we tip our hats to this commission for addressing this noteworthy landmark, we are grateful for another WISH COME TRUE. With this designation, LW! will keep an eager watch for any future alteration (and hopeful) restoration proposals to come for the IRT Powerhouse, the Upper West Side’s 58th Individual Landmark. Read more about this historic feat in CURBED and WEST SIDE RAG.